You won’t pass Quickmax Serum indifferently. It’s the most poplar serum in such a golden-coloured packaging. It doesn’t look tasteful yet the product stands out among others. Quickmax eyelash enhancer is a bit larger and less handy. Both the tube and the cardboard box have the same design. Check what’s hidden inside the bottle that shimmers with gold. 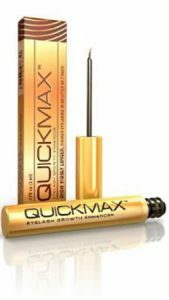 Quickmax eyelash enhancer lets you enjoy fuller and longer lashes. It will work for women who have fragile, short and thinning eyelashes. If they look dull, Quickmax will help you define them yet it isn’t its main task. Most of all, the product boosts growth and makes your eyelashes look fuller. The effect isn’t long-lasting but you will clearly see the difference between the eyelashes before and after treatment. The standard brush is also used in Quickmax Serum. The applicator is a bit wider and shorter. If you usually use slimmer and smoother brushes, you must be aware that you will scoop more serum in case of this product. Quickmax eyelash enhancer also must be used on a daily basis, after a thorough make-up removal, applied to the upper and lower lash line. Do the treatment regularly for best effects. The runny and scentless serum is a bit larger than other products yet it doesn’t equal longer treatment because you’ll use it up quickly. It is based on plant extracts, vitamins, enzymes and growth boosters that have been clinically tested. The price of Quickmax eyelash enhancer is quite low and it reflects the quality and effectiveness of the product. The serum works if you don’t have high expectations. It isn’t suitable for eyebrows.